I've been an ardent reader of pet forums ever since we decided to bring a pup home. And the more I read about Labs, the more in love I kept falling for the breed. There are a load of other breeds that I want to be associated with, like Boxers coz I find them damn cute, Rotties coz they look so fearsome, Great Danes just coz they are gentle giants etc etc... But right now, I have a Lab on my hands and he is quite handful at the moment. (Also, my mom would probably grill me if I bring another dog in the house) So, I'm sticking to having a single Lab in the home. So, why am I rambling about my love for Dog breeds? 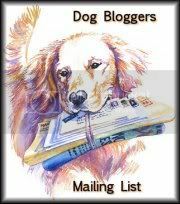 Well, just to say that EVERY single Dog Forum I've been to, talks about how Labs are voracious eaters and how they gulp down their food, and how insatiable appetites they have etc etc. 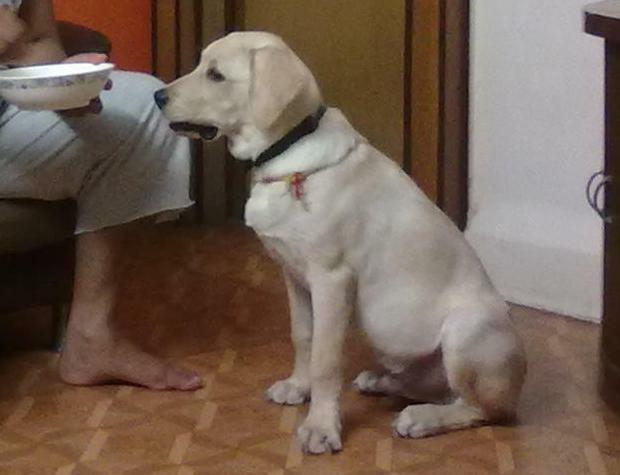 I feel rather strange reading all those people claiming that Labs are voracious eaters. People also seem to believe that they are good learners and can be trained easily. 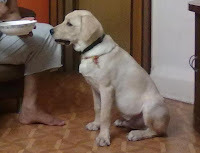 I've a single question to ALL those people out there... How do you train a 6 month old Lab puppy not to FORGET that he is EATING??? Yeah, you read it correctly, how to I train Pluto not to forget that he's eating??? So, coming back to the original Question.... how do I train him not to forget that he's eating??? Do we want them to talk?? ?